Today's News & Observer had an article about the UNC football team, a body temperature pill, heat-related injuries, and concussions. Combine football with science, and throw in a brain injury ... and I'm hooked. This CorTemp capsule allows coaches to monitor players' body temperature, which is helpful in assessing whether or not they should continue practice in hot weather. The N&O article has a neat photo of a player's temperature being taken through his back. The pill is also part of a study that is assessing situations that could promote concussions. Kevin Guskiewicz, head of UNC's department of exercise and sport science, referred to a "theory that dehydration could make concussions more likely;" he added that because symptoms are so similar, it can be difficult to tell if a player is dehydrated or if he has suffered from a concussion. Guskiewicz has been working on another study, in which sensors are inserted in players' helmets to correlate the amount of force it takes in different locations for a player to sustain a concussion. Used together, the temperature pill and the helmet sensor can help determine if the player has sustained a concussion. Further, because Guskiewicz has been testing the pill on other teams, he says that the the aggregate data can help " 'compare the G-forces to the temperature, and try to correlate whether the [G-forces] get higher when the body temperature is hotter.' "
I'm glad to read that researchers are trying to develop methods to prevent situations that can cause dehydration and concussion, because ... I'm ready for some football! Pickeral, Robbi. UNC Gauges a Gut Reaction. News & Observer, August 12, 2009. page A1. 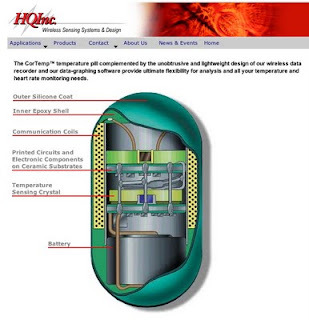 HQ Inc. Press Stories and Downloads (about using the CorTemp pill to detect stress). Sources include NBC Nightly News, a PowerPoint showing CorTemp's use on the Minnesota Vikings in 2006 training camp, and a 2006 IEEE Spectrum article on CorTemp. Nom nom nom: brain food!